Looking for someone you can afford and trust to do your tree work? Our Prices Are EXTREMELY Competitive Because There Is No Middleman. We know… we hear it quite often: “Why are your prices so low?” Well, unlike our competitors, we own all of our own equipment… even the heavy stuff. You see, when you go with the other guys, they’ll go out and rent their bucket trucks and stump grinders. Guess who ends up paying for that? Yup, you do. But not with us. Everything we use, we own outright, even the massive crane we use for big or tricky jobs. There’s no rental bill to cover and no middleman to pay. Plus, all this equipment helps us to work faster, which mean less labor hours. All of this keeps your costs down, down, down. With us, you don’t have to pay an arm and a leg to cut off a limb. Sorry, couldn’t resist! We’re Environment Conscious and Clean Up Our Mess. We’re as concerned about home and our Earth as you are. That’s why, when we leave, we won’t leave your property a mess. Plus, we refuse to bring all that debris to any landfill. All the stuff we clean up gets recycled into reusable mulch. We’re Fast. EXTREMELY Fast. We understand that you just want to get back to the more important things in life. You’ll be amazed (as is always the case with our customers) just how fast we work. Our heavy equipment enables us to work up, over, and around your house or any obstacles that would normally be in the way of the other guys. We’ve Been Around and We’re Not Going Anywhere. Understandably, many people are leery of hiring just anyone. After all, there are many horror stories of fly-by-night crooks that will do a terrible job, and then take your money and run! Rest assured, we understand your concerns, and that’s why we encourage you to give us a call. We’re a locally owned and operated business that has been serving consistent and exceptional service to Central Florida for many years. We Know What We’re Doing… Really, Really Well! You shouldn’t hire just anyone with a chain saw. There is no substitute for skill, experience, and knowledge. We have three ISA Certified Arborists on staff. These are EXPERTS in proper tree care who had to pass a battery of extremely technical and difficult tests in order to receive their certifications. An ISA Certified Arborist may mean the difference between a tree properly and safely removed and one that falls on your house. They can also determine what course of action is best to take on a tree, whether it’s removal, trimming, or some other action. We have helped THOUSANDS of happy customers, and have worked on everything from small private residences to massive commercial properties. 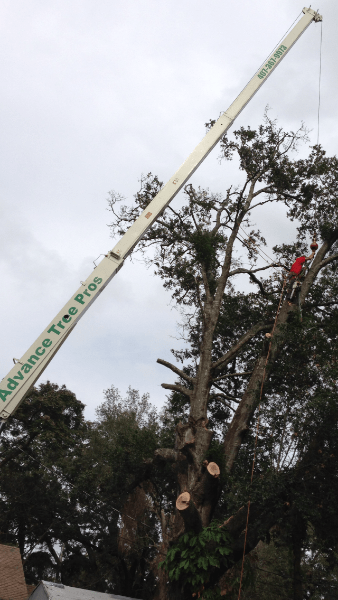 Six Reasons We Will Save YOU Time, Money, & GIANT Headaches on Orlando Tree Service.